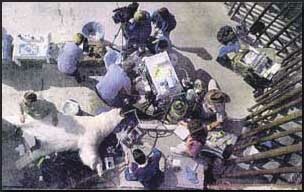 Nuka, one of the Alaska Zoo’s polar bears, undergoes dental work Saturday at the Alaska Zoo. A team of veterinarians, anesthesiologist & dentists from the San Diego Wild Park pulled four teeth and did four root canals. The team used an industrial-strength shop vacuum for suction and also relied on a hand-held drill and grinder in the procedure that lasted nearly three hours.